It's no secret that I love meat. Hence, I seek it out like a car seeks out an accident in Richmond. Places like steakhouses, rib joints, Brazilian rodizio and Korean BBQs are right up my alley. However, there is one more genre that I haven't truly explored very much - Persian food. Sure, it shares similarities to other middle eastern grub, in particular Afghan cuisine, but there are differences. Hence, I headed up to Persian food central, the North Shore, with Rich Guy in search of meat. And where did we end up at? Well, the most well-known one of them all - Cazba. 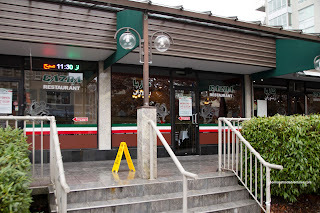 This place prides itself on large portions at reasonable prices. Hey, that is exactly what I like, as they say in Chinese - Peng, yau leng (cheap, but good!). 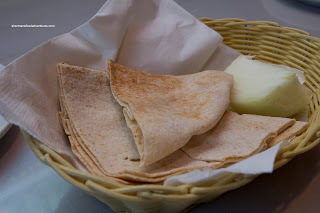 Before our food arrived, we were present with Pita & Raw Onion. Huh? You might ask... Well, it is to use as a wrap with the meats. 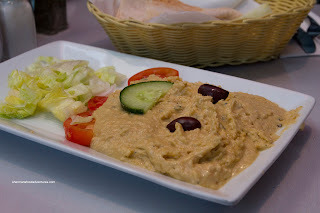 However, I'm not too keen about the raw onion part, so we merely used the pita for the Hummus ($5.00) that we ordered as an appie. It was fluffy and smooth, yet maintaining some bits of texture. There was a definite garlic hit as well as a lemony tang finish. 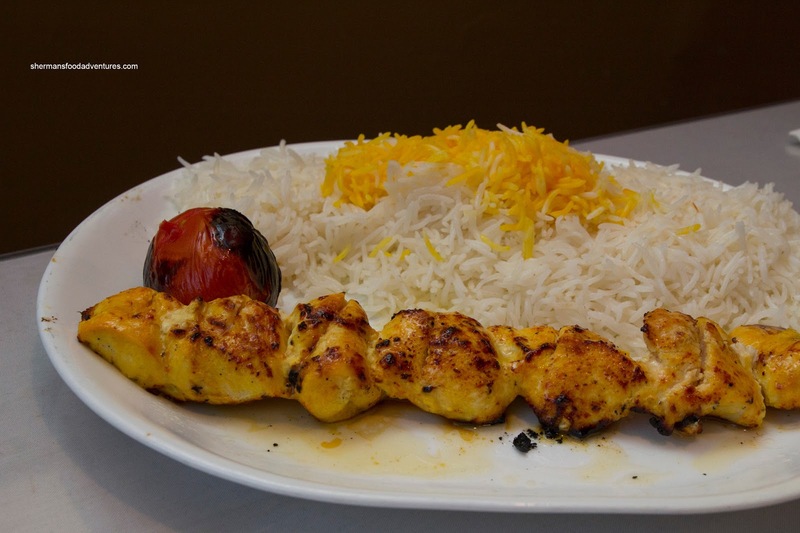 As for our meats, the Joojeh Kebab (Chicken $8.95) hit the table first. It was served with Basmati and saffron rice along with a grilled tomato. Exhibiting a beautiful char (while not burnt) on the outside, the inside was moist and juicy. There was just enough seasoning to add flavour without being salty. 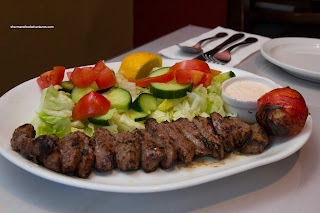 Next up was the Chenjeh Kebab (Sirloin Steak $8.95) which was a healthy portion. Naturally being sirloin, it wasn't exactly super tender, but it wasn't chewy either. Again, there was just enough char and the right amount of seasoning. 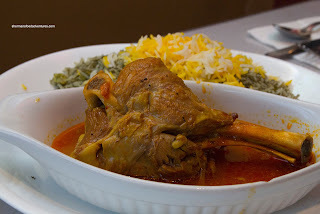 Lastly, we shared one last item being the Baghali Polo & Lamb. At $7.95, this was a fantastic value with a decent-sized lamb shank which fell-off-the-bone. I would've liked to see more seasoning with the meat though. Yes, we did finish all the food and were pretty stuffed. However, it would be more than enough for small eaters. Hence, at the prices they charge, Cazba is both peng, yau leng. Thank you for the review. Being Persian, Cazba is the cheap but medium quality (good value) type of restaurant. Next time you visit, I would suggest trying "Koobide", which is the staple of Persian food, and unique only to Iran. It is simply ground meat (traditionally half lamb half beef) with salt and ground onions on a metal skewer. In one or your food blogs (Thai place on North Road), you mentioned that there are No good Persian restaurants on North Road. There is the newly opened Papa's Shish Kabab, which currently has great quality IMO, specially compared to Cazba. It is on North Road and Como Lake I suggest you try it.